Ranger RZR 570 marks second trail-capable side-by-side from the company. 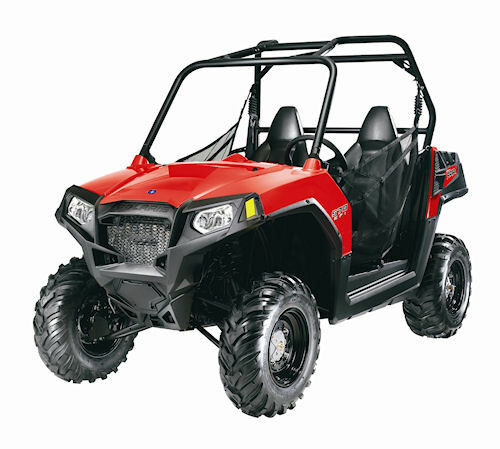 Polaris has unveiled the 2012 Ranger RZR 570, a trail-capable side-by-side vehicle powered with an all new single-cylinder engine to provide a "value" trail machine. The RZR 570 joins the RZR 800 as the second trail-capable member of the RZR family, and carrying an MSRP of $9,999, is expected to allow more customers to enter the trail segment of the side-by-side market, says Matt Homan, vice president of Polaris's Off-Road Division. The new 570 ProStar single is fed by electronic fuel injection, and breathes through a dual overhead cam valve train and head. The new Polaris Ranger RZR 570 is the company's second trail-capable side-by-side, and marks the fifth new RZR introduced in as many years. Polaris engineers matched the new engine with a new transmission specifically designed around the engine's power band, and included a helical cut final drive set -- first featured on the RZR XP 900 -- for applying the engine's hefty torque to the ground. Automatic all-wheel-drive shifts in and out as needed with no attention from the driver. To tackle the trail, the 570's all new Independent Rear Suspension provides 9.5 inches of travel, and the front A-arms move 9 inches, dampened by ZF Sachs shock absorbers on all four corners. Also, an exclusive front and rear sway bar design keep the chassis flat while cornering. The new machine is 50-inches wide and features Polaris's patented behind-the-seat engine placement for a low center of gravity. Safety features include a certified roll over protection structure and side nets designed for easy in-and-out access. For gear, the 570 features a new 300-pound capacity flat cargo box in the rear with Lock & Ride accessory technology and built-in rack extenders. The 570 comes in Indy Red and should be available in dealers showrooms in late autumn. For more information, visit www.polaris.com.